1 Trader Joe's plain bagel with 1.5 tbsp of smoked salmon flavored cream cheese. Thirsty as hell because when I got to lab meeting there we no cups left to drink orange juice with. 1/2 toasted plain bagel with regular cream cheese. 6 oz of Trader Joe's orange juice. Wah, they ran out of all the leftover lab meeting food before I could get to it for a late lunch. All I found was half of a toasted bagel that was already cold and hardening, still sitting all alone in the toaster. Haha so sad. But it beats going out to buy more lunch. 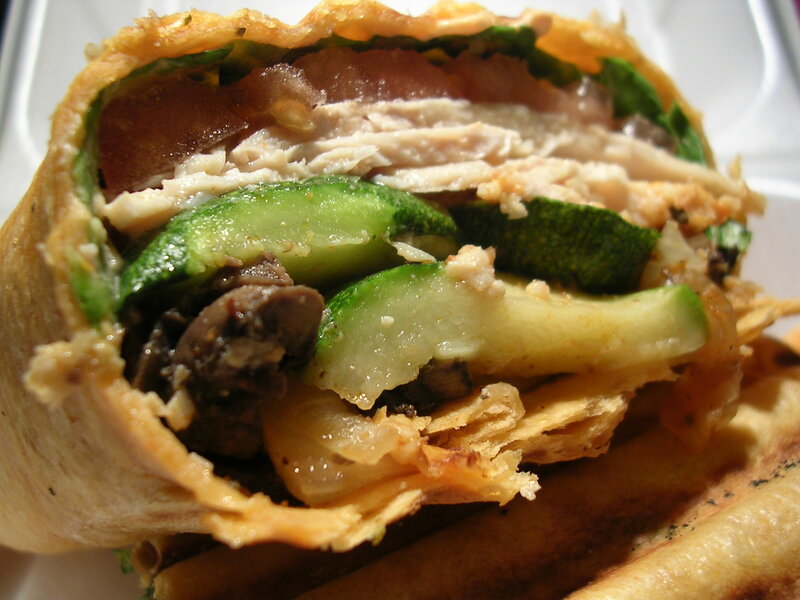 Turkey and chicken wrap: tomato tortilla wrap, sun dried tomato spread, roast turkey and chicken, lettuce, tomatoes, zucchini, mushrooms, onions. Toasted on a grinder toaster. Yum, I love the toasted crispy tortilla shell and the warm richness of roasted vegetables (there's something jarring about eating raw vegetables that I do not have an appreciation for… perhaps it is because I grew up eating Chinese cuisine, which uses almost no raw vegetables). I also really enjoy the fact that Baker offers the roasted turkey meat instead of the popular turkey ham that you see in supermarkets. I hate the overly salty, rubbery texture of turkey ham. It's not what turkey should be at all, unless you're using it as a healthy alternative to regular ham or something. This entry was posted on Thursday, April 26th, 2007 at 9:05 pm	and posted in American, breakfast/brunch, poultry, snacks, Uncategorized. You can follow any responses to this entry through the RSS 2.0 feed.